The newly redesigned 2019 Kia Forte checks all the right boxes, with enhanced safety, fuel economy, and interior comfort. 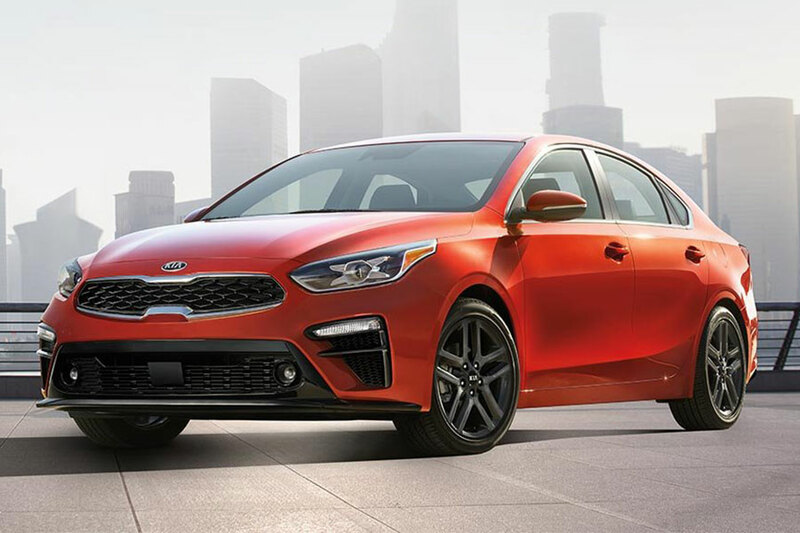 After a complete redesign, the 2019 Kia Forte offers a new look, greater interior refinement, and a stronger focus on fuel economy. And you get all of it at the Forte’s modest price. This new model borrows from the sporty Kia Stinger’s fastback design, delivering a longer hood and shorter rear deck. The overall effect is a sleeker, more coupe-like Forte. In addition to its fresh style, the updated Forte also features a stronger body, made with 54 percent high-strength steel. Although crash-test scores aren’t out yet, this new sedan is widely expected to earn top marks. The newly upgraded cabin includes a standard 8-inch touchscreen, which sits atop a newly redesigned center stack. The touchscreen is responsive to your input, and the dash controls are easily accessible from the driver seat. Compared to previous models, the Forte also comes standard with additional leg room and increased cargo space. With 15.1 cubic feet for your gym bags and grocery hauls, the Forte is on par with segment competitors. Although the output remains the same, the new Forte powertrain puts a greater emphasis on efficiency. The new Intelligent Variable Transmission helps this sporty sedan earn up to 35 mpg combined. Kia also engineered the transmission to feel more like a conventional automatic. It simulates gearshifts, which contributes to the Forte’s smooth, sporty ride. Which 2019 Kia Forte Trim Model Should I Choose? The 2019 Forte sedan comes in four trims: the FE, LXS, S, and EX. The entry-level FE gives you a great deal on a comfortable, modern ride. 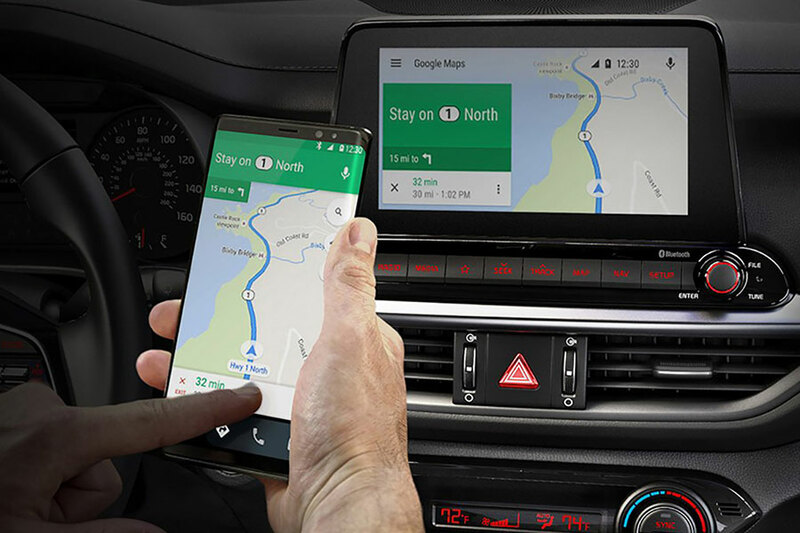 In addition to complete smartphone integration, the FE includes an easy-to-use 8-inch touchscreen infotainment interface. Dual-zone automatic climate control sets two separate temperatures for driver and front passenger, creating extra comfort on your next road trip. The LSX is a bit more stylish, with fancier trim inside and out. It also includes selectable drive modes, so you can tailor transmission settings for a sportier or more fuel-efficient ride, depending on your fancy. Upgrade to the Forte S for additional safety features and a splash of luxury. The S delivers Uvo eServices connectivity and emergency telematics, making it easy to call for help after a breakdown or collision. The leather-wrapped steering wheel and shifter give the cabin an upscale vibe. You’ll find all the trimmings in the top-of-the-line EX. The keyless entry and ignition features are just what you need to make a speedy getaway. When you approach your EX with shopping bags in hand, the hands-free trunk opener is at your service. In hostile weather, the heated and ventilated front seats cool you down or warm you up accordingly. The 2019 Kia Forte is loaded with conveniences. Standard items, like remote keyless entry, save you massive amounts of time in small increments. Every trim model also includes complete smartphone integration. Apple CarPlay and Android Auto connectivity mean you can use smartphone apps from the Forte’s central touchscreen. It’s a safer way to stay connected; you can even use your phone’s sophisticated voice controls to call home or dictate a text. Add high-end features, like the 320-watt Harman Kardon sound system, for a premium infotainment experience. The optional wireless charging tray keeps the iPhone 8, iPhone X, and compatible Android devices ready for action with no strings attached. Is the 2019 Kia Forte Safe? In the new Forte, you’ll see trouble coming. This sedan offers the full suite of driver aids. Blind-spot monitoring helps you switch lanes safely, and lane-keeping assist keeps you on the right path. The Forward Collision-Avoidance Assist system offers two potentially lifesaving features: automatic emergency braking and forward collision braking. In addition to automatically braking in the face of an oncoming crash, the 2019 Kia Forte can sense pedestrians and hit the brakes accordingly.